You have added A Little Leopard Goes A Long Way Maxi Dress in Dusty Coral into shopping cart. FINAL SALE. We love adding touches of fun animal print patterns to our wardrobe--in a subtle and sophisticated way. This dress will let you take a walk on the wild side without overdoing it! The A Little Leopard Goes A Long Way Maxi Dress is fully lined to below the knee. The lining of the skirt is a gorgeous leopard print pattern that matches the leopard fabric piping at the bust. 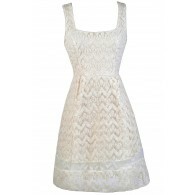 This dress has a sweetheart neckline, lightly padded bust, and adjustable spaghetti straps. Leopard print fabric piping at the bust adds contrast to this look. The floor length maxi skirt is made of semi-sheer chiffon so that you can see through to the printed lining, giving it a fun look in a subtle and sophisticated way. Fabric ruching at the back of this dress completes this look. The A Little Leopard Goes A Long Way Maxi Dress is a cute dress to wear on vacation somewhere warm. Dress it up with wedges, pumps, or strappy heels and a clutch. Or dress it down with flat sandals and a oversized bag for a chic casual style. This dress manages to be fun and classy at the same time. Details: Fully lined to below the knee. Adjustable spaghetti straps. Lightly padded bust. Fabric ruching at back. 75% silk, 25% polyester. Lining: 100% polyester. Hand wash cold water separately. Color will bleed. No bleach. Hang to dry. Small measurements: Length from top of bust to hemline: 52". Bust: 30". You have added A Little Leopard Goes A Long Way Maxi Dress in Dusty Coral into Wishlist. You have added A Little Leopard Goes A Long Way Maxi Dress in Dusty Coral for Stock Notification. You have set A Little Leopard Goes A Long Way Maxi Dress in Dusty Coral as a loved product. You have removed A Little Leopard Goes A Long Way Maxi Dress in Dusty Coral as a loved product.